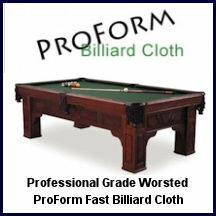 Pool table felt, billiard felt, and worsted billiard cloth on sale in every color, weight, speed and size. 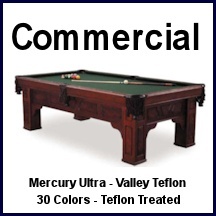 Our sales can fit any budget, from the beginner looking to familiarize himself with the game to the professional wanting to cover his table with the best cloth available. The quality of felt or cloth covering your table will substantially affect the way the game is played, making your choice of felt or cloth vital to creating the experience you've invested in. 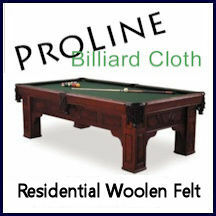 Pool table replacement felt kits make installation easier--no more guessing at how big to make the bedcloth or how to size the rail cloths, plus each cut is hand inspected for flaws before it ships. Starting at $89, this manufacturer offers a selection of value-oriented woolen felts that are noted for ease of installation. Starting at $163.90, ProForm is a worsted cloth similar to Simonis but offered at a price not much more than standard "woolen" felts. Starting at $226.99, Simonis offers fast, highly durable worsted cloths that make for the some of the best playing surfaces available. All orders qualify for free shipping, plus you'll get a dozen pieces of color matched chalk.